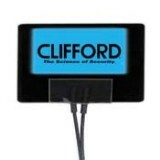 Clifford 620C Flashing Electro Luminescent Indicator This is a Electro-luminescent Blue Glowing LED style of lighting. It is less than 1/8 of an inch in thickness and includes all parts. It's perfectly designed to mount onto vehicle windshields and/or side doors. 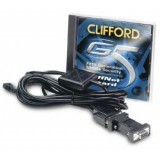 It's bright blue glow can be seen..
Point and Click Control One of the coolest things about Clifford's G5 technology is the ability to plug your Windows PC into the system/accessory chain and run the CliffNet Wizard. CliffNet Wizard allows you to customize and control your Clifford G5 system and accessories with point-and-click.. Call Now To Arrange Fitting 0114 2349927 or 07786194655 email sales@1stcallcarsecurity.co.uk 1st call car security We are a approved Clifford dealer with over 30 years fitting Experience and we can fit this system in south Yorkshire at one of our premises, your home or pl..